This week my art journal got a twofer. 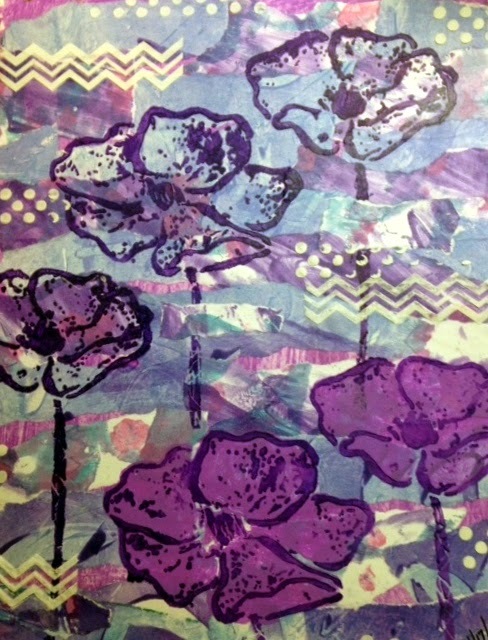 The prompt for The Documented Life Project was Gelli Prints and Journal 52 was Collage. Ta Da..... my twofer. 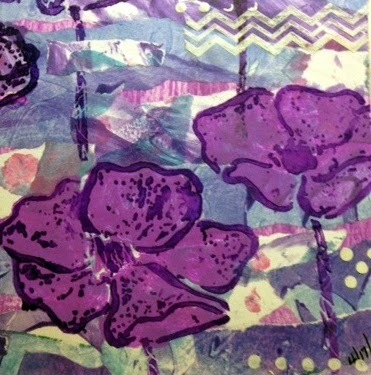 I think I'm finally getting toward the end of the many, many gelli prints I made when I first got my gelli plate. That means it's will soon be time to start a whole new batch. This page is a combination of three different prints that I tore horizontally and collaged on watercolor paper. I've said before that tearing and gluing is a very meditative experience for me. It is so relaxing to loose myself in the process. The original prints were made on recycled copy machine paper with inexpensive craft paint. The flowers are a Donna Downey I-Stencil stencil and craft paint. The bottom two flowers were stenciled, then I painted them and then stenciled again to get the crisp lines. I let all the glue and paint dry overnight and then I stenciled the dots and zig zag lines using Artist Loft embossing paste.